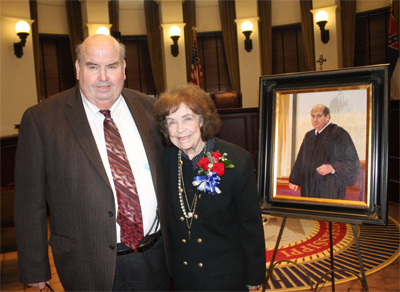 Judge James L. Roberts Jr. of Pontotoc was honored for his career of more than 40 years of public service on Jan. 18 as he presented his portrait to the Mississippi Supreme Court. Before his wife Rose and artist Robbie Boyd unveiled the painting, his protégés and colleagues painted a word picture of a judicial scholar, mentor, teacher and good humored story teller. Chief Justice Bill Waller Jr. recalled Roberts’ six and one-half years of service on the Supreme Court as marked by hard work, scholarly decisions and good humor. Among his most significant contributions were his work in setting in motion the Court of Appeals after the Legislature authorized its creation as an intermediate appellate court. Roberts as a Supreme Court Justice served on the Rules Committee that adopted operating rules for the Court of Appeals before it began hearing cases in January 1995. He also played a leading role in finding a place to house the Court of Appeals. “From the Biblical Book of Micah, he acted justly and walked humbly before the Lord. He was a Christian example for all of us,” Chief Justice Waller said. 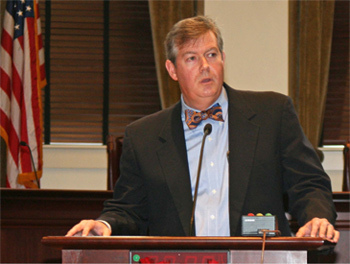 Russell served as Roberts’ law clerk from August 1996 through May 1998. Judge Roberts taught law, the appellate process, legal writing and ethics. He taught by example how to treat people – those whose matters came before the court, and those whom he encountered. Judge Roberts thanked family and friends who traveled from north Mississippi for the ceremony, six of his former law clerks, and former colleagues in attendance including Chief Justice Waller, former Chief Justice Jim Smith, former Chief Justice Edwin Lloyd Pittman, former Presiding Justice Fred L. Banks Jr. and former Presiding Justice Chuck McRae. He enjoys being a circuit judge, having been appointed to the First Circuit bench in December 2007. “I intended to serve maybe about a year as Circuit Judge and then disappear from that,” Judge Roberts said. He’s in his twelfth year. “I have continued to serve because I think I owe a debt for the state of Mississippi sending me to the Judicial College and to other schools.” He said he thinks that if he is able to make a contribution, he should. As a youth, he knew other distinguished members of the Supreme Court. He views the court through the lens of history. Ever the historian, he treated the crowd to personal anecdotes about Justice William Henry Inzer of Pontotoc and Justice Henry Lee Rogers of Louisville. Justice Inzer served from 1966 to his death in 1978. “I grew up delivering his paper sacking his groceries. I thought he liked me a lot until I realized he actually voted for my opponent every time, but that’s OK.” He recalled visiting Justice Inzer at his office at the New Capitol while a student at Millsaps College. Inzer, wearing a green eyeshade and underling case materials in red pencil, greeted him and told him to leave because he was busy. He recalled visiting Justice Inzer’s grave in Calhoun City. A modest stone marks the final resting place of a man who distinguished himself in military and judicial service. Video of the ceremony is archived at this link: https://livestream.com/supremecourtofms/James-Roberts-Portrait.